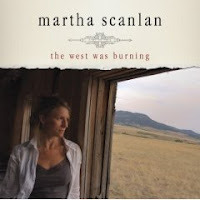 Plochmann Lane: Martha Scanlan's album. Just picked up Martha's '07 album The West Was Burning that was recorded @ Levon Helm's studio / barn & in Louisiana. 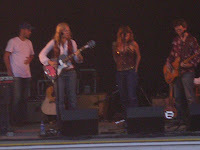 We were fortunate enough to see her perform a couple of Saturday's ago when she filled in for Amy Helm w/ Ollabelle @ the 137th Tunbridge (VT) World's Fair (in 2nd pic wearing dark tanktop). She has a beautiful voice fit for the similar music genre as Levon & Ollabelle. Levon, Amy & Glenn Patscha all participated in the recording of her album.